Your resource for federal office posting requirements. Call it one of HR’s most important (and seemingly old fashioned) compliance obligations: hanging up workplace posters. 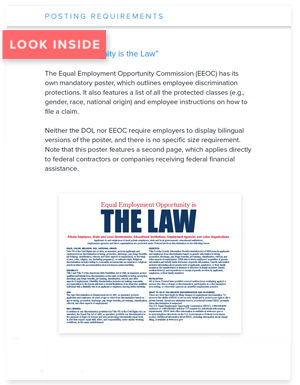 Employers are federally required to display notices or "postings" covering a broad range of issues, including the minimum wage, workplace safety, and family leave. We all want to go paperless, but workplace posters are here to stay for the foreseeable future. We've put together the most essential federal workplace posters for 2019, all in one place—totally free of charge.